Samsung Gear VR has plenty of potential. This viewer seems to focus more on watching cinematic experiences and less on gaming. The positive is that Samsung and Oculus have made it easy to import and watch your own movies (even 3D) in virtual cinema mode. Since it's crisper and sharper to watch movies in Blu-ray, why not get movies off from your Blu-ray discs and import them to Galaxy VR for amusement? That sounds nice but how to ensure the maximum quality and create 3D effect? Well, here we share you the top solution to create 3D movies from Blu-ray for playing on Gear VR on Mac. 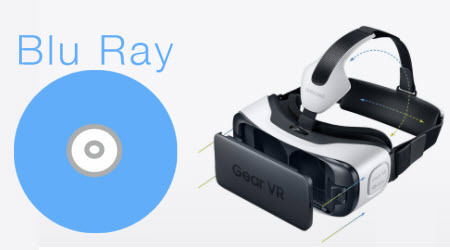 To accomlish the task, at first, you need to get the Blu-ray Disc ripped into Gear VR supports most conventional file formats like MP4, AVI, and FLV 2D videos or 3D SBS MP4/MKV so as to play Blu-ray on Gear VR. Transfer the Blu-ray files to SD card, and then play 2D/3D Blu-ray on Gear VR in Oculus Cinema freely. 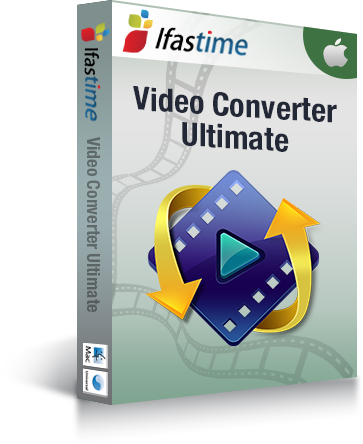 It's easy to do with some help from a third-party Blu-ray ripping tool like iFastime Video Converter Ultimate for Mac. It is easy to use for conversion, editing and makes great quality copies of my Blu-rays. Not only it's used as an amazing 2D to 3D video conversion software tool, but it's also a BD/DVD/video converter to help you rip Blu-ray, DVD and ISO files to Samsung Gear VR highly supported 3D Side By Side (Full) and Side by Side (Half-Width) MP4/MKV video files on Mac (El Capitan Included) with high output video quality and fast ripping speed. What's more, it can also output 3D models including Anaglyph (Red/cyan), Anaglyph (Green/magenta), Anaglyph (Amber/blue), Top and Bottom (Full), Top and Bottom (Half-Height) for watching on 3D devices. Windows vesion is here. Just download it now and follow the steps below to rip Blu-ray movies to Samsung Gear VR for smoothly playing in just a few mouse clicks! Launch the top Mac Blu-ray to Gear VR Converter, add your Blu-ray files by clicking the "Load file(s)" icon from Blu-ray drive. Keep the nework connected when ripping Blu-ray. As we mentioned above, Gear VR supports MP4, AVI, FLV, etc format. You can click the "Format" bar and choose one from "Common Video" list. If you want to play 3D movie with Gear VR, "MP4 Side-by-Side 3D Video (*.mp4)" or "MKV Side-by-Side 3D Video (*.mkv)" from "3D Video" profile list is recommended for Samsung Gear VR. By clicking the "Settings" button, you can modify the video/audio parameters. 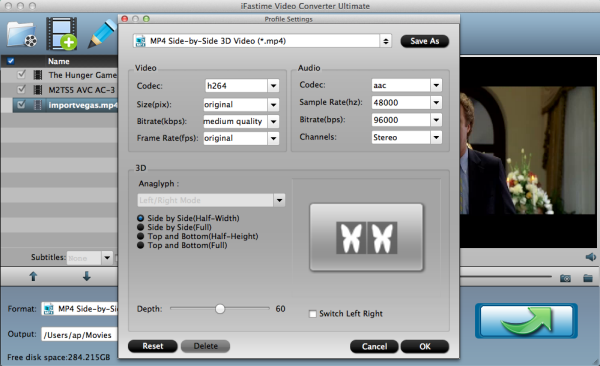 For common videos, 1280x720 HD resolution and 5 Mb/s video bitrate are recommended. 1920x1080 compressed side-by-side 3D should be resampled to 1920x540 resolution full side-by-side resolution. The last step is to press the big "Start conversion" button on the right to start converting Blu-ray files to Gear VR on Mac. The conversion takes a few minutes, if you don't have time to wait, you can choose "Shut down computer after conversion". Then your computer will be turned off automatically after the conversion is finished. After conversion, you can click "Open" to locate the output videos. Then you can transfer and play videos on your Gear VR from SD Card. Once you have created your 3D content folder and imported compatible video files, insert your MicroSD card into Galaxy Note 4 (if it isn't already), dock the phone in your Gear VR, and don the virtual reality headset. 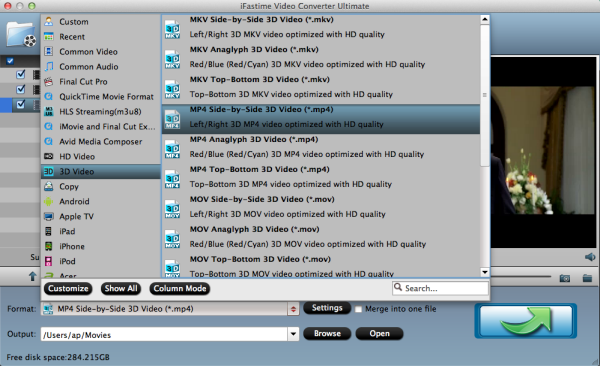 The software is coded to automatically convert any video in the "3D" folder for 3D playback. While watching the video in Cinema, a new subtitle option will appear in the player controls (gaze and tap the screen for the controls to appear). Now, you can enjoy 2D/3D Blu-ray movies on your Samsung Gear VR through Oculus Cinema via Mac with ease. This is one of the best Blu-ray rippers I have ever used! It works flawlessly, and has a user friendly UI!